On March 4 2017 “Tony Cragg : A rare category of objects” opened at Yorkshire Sculpture Park. The exhibition is a retrospective of Tony Cragg’s creative mind at work since the 1980s. It encompasses historical and new works and presents an array of materials from paper to plastic, stone to steel. A bit of background on the artist is given to us by the famous Wakefield institution : “A ‘radical materialist’, Cragg defines sculpture as a ‘rare category of objects’, and takes a taxonomic approach to his own practice, something which is reflected in the exhibition. The wit and will to analyse the properties of all of the planet’s resources and use them to make new things is unique to human beings, along with the intuition to sort, order and categorise the things that exist and that we bring into existence. Cragg’s extraordinary career has its roots in a fascination for, and exploration of, the possibilities of the material world, which he considers to be ‘the huge storeroom [in which] lie the keys to essential processes and explanations of our existence’. (…). From the small scale to the monumental, Cragg’s prolific practice is the outcome of a constantly questioning and experimental symbiotic process of thought and manual making, which always starts with drawing. With the support of his studio, Cragg makes his sculptures by hand, each evolution of thought taking form and inspiring the next. His intuition to sort and categorise, evident in his childhood fossil collection, is expressed in the significant early stacked series in which the accumulated content of his studio, including stones, wood, and books, are formed into geological-like sculptures.”. 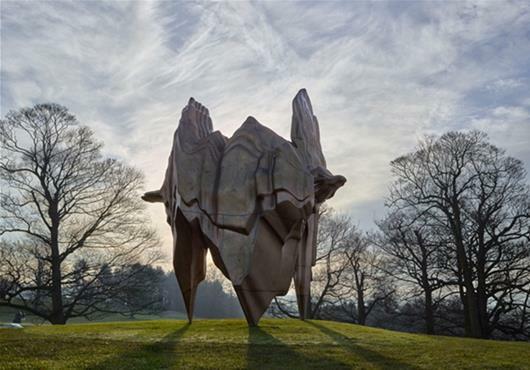 For more informations on this exhibition (ending Sept. 3, 2017), please visit the page of the Yorkshire Sculpture Park. And for those closer to Luxembourg, please note that MUDAM Luxembourg is also currently hosting a Tony Cragg exhibition (ending Sept.3, 2017 as well).